This new piece of art for the ‘Atlantis Project’ is called Sravkiss, named after the large, scaled monsters that Artorius is fighting. And yes, that is Artorius in the glowing powered assault armor. How do I know? Well…I guess it is kind of hard to tell. All the knights do look the same, for the most part anyways. If you look on his arms you will see three gold plates, those represent his rank as a master on the council. That, at least, narrows it down to six or seven, I forget the exact number. Check out the Cover Art if you want a closer look at the Lightplate. Thought interjection. Am I going to have to delete the excerpts from my blog posts when the book is released? I don’t want to give away any spoilers, so I guess I probably should. Artorius woke covered in sweat. Terror gripped his heart and he peered around the dark room; it was empty. He looked into Neiram and saw Valens standing against the wall, hand on the hilt of his Lightblade. “What is it?” Artorius asked. The guardian looked worried. “An evil has entered the city,” the Malik responded. Artorius nodded. His song was urgent and he rose quickly from the bed. He had disrobed to sleep and stood naked in the room. He walked over to one of his saddle bags and removed a clean body glove and stepped into it, zipping it up to his neck. He then began to channel and stepped into his armored boots. He quickly pulled the rest of his plates to his body, waiting impatiently as they conformed. He heard a scream outside, it galvanized him and he damned his armor for being so slow. When his last plate conformed he grabbed his helm, put it into place and began to move out the door before it finished conforming. He ran out the door of the inn and heard a bestial roar from the center of the city. The druids are fighting back, he thought. He took off in the direction of the roar, running with all his speed, zipping by the buildings until he reached Javan’s hall. His mask finished conforming and when the interior turned transparent he activated his blade, took hold of a large flux of Teren, and then charged the wall. In an explosion of shattered bricks, he burst through the wall and beheld a scene from hell itself. Blood appeared to coat every surface, a dire-bear lay on its side in a pool of gore, and three black scaled monsters were tearing into it as it tried, in vain, to fight them off. Bodies of soldiers lay strewn in different poses of death. One of the monsters shrieked, an ear piecing howl that sent a shiver of terror down Artorius’ spine. The creature it came from sat upon the body of a man that Artorius’ recognized as Javan. Blood covered the creature’s fangs and dripped from the bony ridges of its face. The monster activated a Darkblade and charged. Artorius’ boot caught the monster in the chest. The blow carried with it the power of a Covenant blessed, 7-foot-tall 300 pound Atlantean. It was sent with the precision of a master mixed martial artist with over 300 years of training and fueled by his connection to Teren and then amplified fivefold through his Lightplate. The blow struck the monster with nearly 30,000 pounds of force and Artorius heard a sickening crack as the monsters’ reinforced bones shattered, sending it hurtling into the face of the bear. It lay there stunned, blood bubbling from its mouth. The bear roared and with a final effort of strength bit down on the scaled monster’s bony head. The bear’s eye teeth cracked through the hard plates on its head and a moment later a sickening crunch sounded as the skull cracked open. The bear then fell back onto its side and ceased moving. The three remaining monsters howled and turned to face Artorius. Blood from the fallen dire-bear—druid—dripped from claws that reached for the hilts of Darkblades. The hilts activated, black blades that quickly turned ruby red as satanic power flowed through them. Artorius didn’t wait for them to charge. He leapt into an attack, falling into Kenapor and slashing, the glow of his blade throwing strange shadows in the room. His attack caught them off guard and his sword cut viciously across a chest. The blade scoured the reptilian plates, but didn’t penetrate. The monsters reacted with a whirlwind of blows and Artorius danced among them; ducking and dodging when he could, parrying when he could not. He had never fought opponents with so much hate in their hearts. Their fury was intoxicating as he filtered it through Kenapor, harnessing the power. They were taller than Artorius, but in his armor he represented a great deal more weight. He ducked a swing from one and then with an open palm caught the other on the face, gripping. He spun and slammed the creatures head into the panels on the floor, cracking the wood. The Knight jumped, flipping in the air to land behind the other two as the first one scrambled back to its feet. They are un-killable, he thought to himself as the monster shook its head, recovered, hissed, then climbed back to its feet. He spun and slashed, the light from his plates reflecting off their scales. Artorius pushed aside a blade and lunged with all his strength. The point of his blade punched through its armor and the blade came out the other side. Artorius spun on his left heel and flung the creature, it sailed through the air and smacked against one of the huge support logs. It crumpled to the ground and remained still. Artorius realized that whatever these things were, it wasn’t their scales that were deflecting his attacks. They had wards protecting them much like those of the druids. The other two howled and closed on him. Artorius sent out a blast of holy energy. It picked both of them up and slammed them against the wall. He leapt after them, parrying a blade from the one on his left and kicking out at the other one, catching it in the knee. It dropped, shrieking. The first one caught a lucky break, its blade crunching into Artorius’ left vambrace. The plate, already cracked, shattered from the impact. He stumbled back and quickly released his hold on the now powerless left gauntlet. The monsters had been all fury up to this point but as Artorius fought this last one it became more calm and its strikes more precise. They traded blows. Artorius lunged for the throat, his strike perfect, but before it could land the monster with the shattered knee latched onto his back. He caught a blow on the side of his helm from the one in front of him and stumbled back. He tripped and landed on his back, the weight of his four hundred pounds of armor coupled with his own three hundred pounds of body weight, knocked the wind out of the monster on his back. Artorius rolled on his shoulder, breaking its grip. Back on his feet he reached a hand out and grabbed the creature still standing with his will. The monster fought back, trying to break the hold; it was angry, and strong. It hated Artorius and its fury beat against the Master with all its strength. Artorius, however, was calm. He took the creatures rage and filtered it through Kenapor, feeding it through his body. 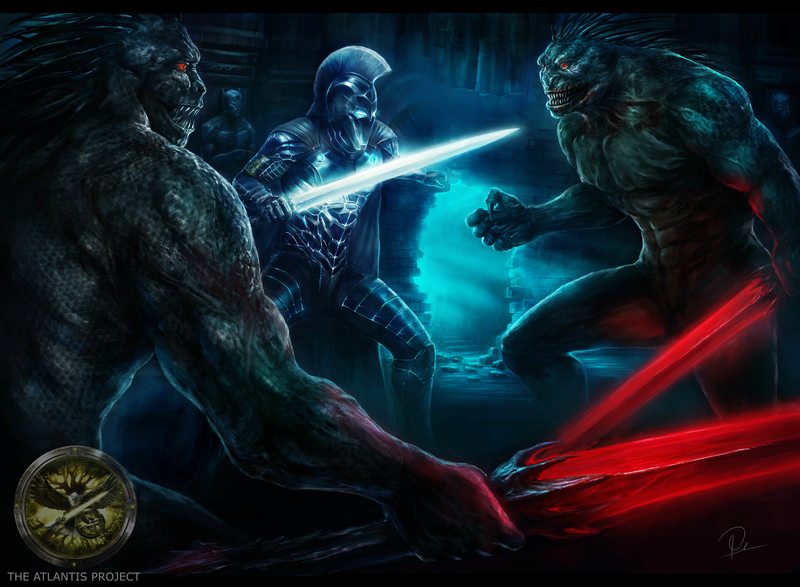 Artorius roared from the power as Teren burned in his blood and the fury of the creature amplified it. The room brightened, his vision misted, turned red, and then he closed his fist. The black-scaled monster groaned and then began to crumple. Its body twisted, bones cracking, and finally when Artorius felt the life leave it, he dropped it to the ground. Artorius stumbled to one knee, gasping from the exertion, his cells screamed at him from the use of so much power. He took a deep breath and then rose to his feet turning to see the one he had fallen on trying to rise. Its knee was shattered and one of its arms was bent at an unnatural angle. Artorius walked up to it. Kicked it in the chest, knocking it back to the ground, and then stamped on its head. Its skull exploded and brain and tissue spat on his armor. There was another one groaning in the corner. Its leg a crushed red and black mess from where the druid had torn it. Artorius dispatched it with his blade, a straight lunge to the head. It was over and he was the last one standing. Look at the detail. Every time Hoang sends me the final file of a piece of artwork I open it like a kid on Christmas morning, and I’m always blown away. It’s actually kind of funny, almost every time he sends me a piece of art, I end up having to change or add something in the book. He just has a way of reading my mind and adding little details that I didn’t even think of when I first wrote the scene. Check out the Guardians of Atlantis, and the Seal of Atlantis. Thanks! I love the guy and feel pretty blessed I was able to get him to do the art.